The Boholano is fond of riddles. 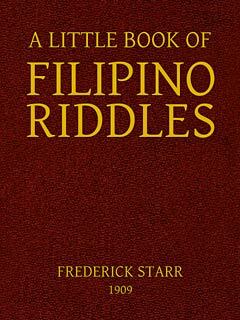 Here we present a small collection of riddles, both in Cebuano and English. But I use it for hanging only. Answer. Earrings. He can climb a coconut tree. Answer. Ant. When opened, could not be closed. Answer. Egg. Nanahon'g kalipayan. Tubag. Buli. What a mysterious tree! Its leaves are useful	 Answer. Buri palm. Gihalog ako og maniwang. Tubag. Seda nga senena. Someone thin embraces me. Answer. A thin silk dress. And questions were asked when it came near. Answer. Dead. Mi tindog nga walay punoan. Tubag. Ang kalibutan. Oh, What a surprise! It stood without a trunk. Answer. The world. While the child is sitting. Answer. Squash Plant. Is filled with bullets. Answer. Papaya. Could not see each other. Answer. Ears. Answer. A pair of shoes. Mosunod, bisan asa ako	 Tubag. Anino. It follows me, wherever I go. Answer. Shadow. Laing tao ang mogamit. Tubag. Pangalan. I own it, but I don't use it. Answer. Name. May usa ka balay nga usa ray haligi. Tubag. Payong. There is house with only one post. Answer. Umbrella. May baba apan dili makasulti. Tubag. Langub. It has a mouth, but it cannot talk. Answer. Cave. It walks without feet. Answer. Pen. May usa ka tao, nga dili makabakak. Tubag. Tawong patay. He is a man, but cannot tell a lie. Answer. Dead man. But my heart is always yellow. Answer. Egg. But the blood flowed here. Answer. Flood. Sitting on a cup. Answer. Casuy fruit. I'll tell you tomorrow. Answer. Dream. The fruits is on the leaves. Answer. Pineapple. Is eating her own body. Answer. Candle. It has no mouth, but can talk. Answer. Letter. Why it is crowned? Answer. Guava. But cannot touch it at will. Answer. Sky. While the child sings. Answer. Mother pig and piglets. While I fish for you	 Answer. Net. That needs no winding? Answer. Rooster. While the rain comes from below? Answer. Boat. She throws away the draper. Answer. Banana blossoms. Please tell us about any old riddle you know. Maybe you can ask an old relative to tell you some riddles, and share them with us. where can i find the answers for these riddles? Ang tanan nimu ging-higugma ko (Bisayan or Visayan) Please tanslate for me.maybe a riddle or proverb ? where can i find the answer to these riddles? i really need it for a project/assignment!!! thank you very much!!! Where can i find the answers of these riddles. i badly need it for my project. thank you. Read all 77 comments by readers. your comments on "Boholano Riddles"
This article has been viewed 909 times.